Looking for the perfect pair of summer earrings? Look no further than One King’s Lane this week, because they have a stellar trunk show focused on just that. These gold-dipped shark tooth studs are number one on my list. Also loving these malachite-inspired studs and these oversized turquoise & gold earrings. Click here to shop the entire trunkshow! If you saw my Instagram yesterday, you’ll know that I’m all about (ankle) strappy sandals for summer. I just picked up two new pairs! This white pair by Proenza Schouler was a no-brainer for me – they’re adorned with the designer’s signature hardware that you see on their PS11 handbags. These beauties also come in peach and black at Saks Fifth Avenue. The second pair I selected is this sassy cobalt suede pair by Alexander Wang. It’s just the right pop of color and is the perfect statement shoe without being too over the top. They’ll be fabulous with everything from skinny jeans to cocktail dresses! Which is your favorite? Be sure to follow me on Instagram for more sneak peeks of what I’m buying and wearing now! Can we take two seconds to talk about the Met Gala last night? Lots of gorgeous gowns, per usual, but the standouts in my opinion included Blake Lively (always a favorite), Diane Kruger, Suki Waterhouse, Gisele Bündchen and Beyonce. I saw a lot of plunging necklines which is typically not my favorite silhouette, but last night I loved it! Which were your favorites? I’ve had my eyes on that Zara skirt for a while love the details. And I agree Beyonce and Blake were my top 2.
fabulous edits! 4,6, and 11 are my favorites. I love the gold & neutral palette! I insist, those shoes are to die for! 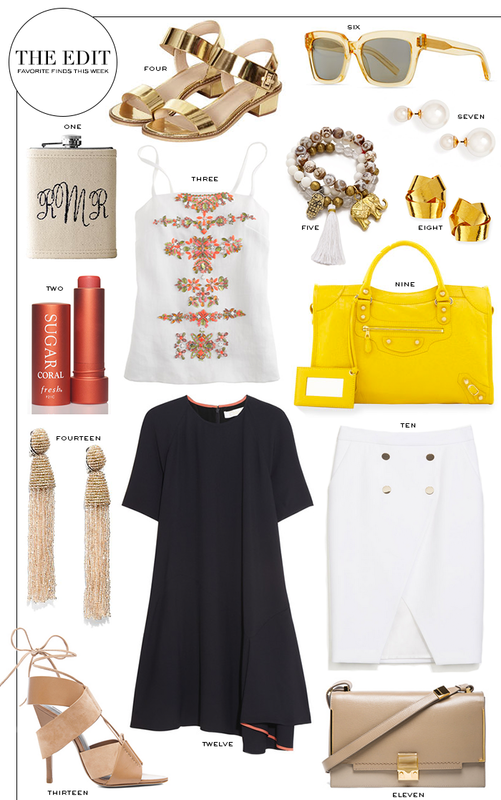 i’m absolutely in love with that jcrew beaded tank! That Chloe dress is just dreamy, stunning! The beading on that linen tank is incredible! Blake Lively looked amazing (as always) and I loved Arizona Muse’s Zac Posen dress! 9! love love love 9! That Lanvin bag is superb! #3 makes me want to go on vacation now! I love this gold/yellow edit! Those topshop gold sandals look so luxe without the huge pricetag! That sugar lip balm is one of my favorite! Great picks! I need those Alexander Wang sandals in my life!! LOVE all of these pics! Both pairs of those shoes are amazing and that Zara skirt is gorgeous! Fabulous picks as usual! Three, four, five, six, and twelve are my faves! Love every thing here! Three and thirteen are fab!! As for last night’s looks, my faves were Dakota Johnson, Anne Hathaway and, of course, Queen Bey. I absolutely love your edits! You pick out the best combos! AMAZING round up!!! LOVE your pics!! Great picks! I certainly wouldn’t mind having the gold flats, the bracelets and the skirt from Zara I tried in peach…with fail. But the white one is cute too. Wow, that Chloe dress is absolute perfection! I have a bit of a bad obsession with Sugar chapstick, I use it constantly! I love the clear to use throughout the day, but also have a few of the tinted ones as well. The tinted ones are great, because I am not much of a lipstick or lipgloss person, so I love reaching for those when I want a little bit of color!